The passage through Parliament of the Trade Practices Amendment (Australian Consumer Law) Bill (No 2) 2010 highlighted one issue that remains unresolved. Just who is the consumer that is deserving of protection? In seeking to find an answer to this, we look to the past and highlight the etymological basis of the word 'consumer'. We then examine its current legal definition and the problems associated with this. In doing this we illustrate the comparative and interdisciplinary understanding of the consumer. Our thesis is that attempting to find a single universal definition of what it means to be a consumer is unlikely to yield a productive result. Rather our solution is two fold. First, accept for the purposes of the consumer guarantees that all transactions are consumer in nature and, supplementary to this, make an argument for developing a unifying theme of who the consumer is throughout the legislation. 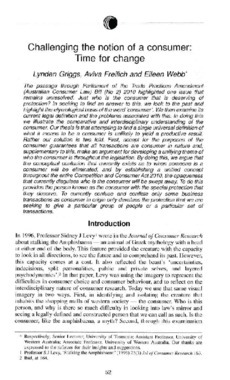 By doing this, we argue that the conceptual confusion that currently exists as to when someone is a consumer will be eliminated, and by establishing a unified concept throughout the entire Competition and Consumer Act 2010, the opaqueness that currently disguises who is the consumer will be swept away. To do this provides the person known as the consumer with the special protection that they deserve. To currently confuse and conflate only some business transactions as consumer in origin only devalues the protection that we are seeking to give a particular group of people or a particular set of transactions.